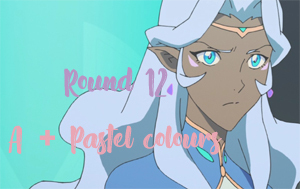 Welcome to Round 12: A+ Pastel colours. For this round you have to icon a series/game/character etc. starting with 'A'.The icon should also use pastel colours in some way;it can be in the background,text,overall colouring etc. Below are some examples to inspire you. Icons must not exceed 40 kb and must be 100 px X 100 px. Submit your icons as a separate post to the community. The deadline is 7th May, 2019. I learned a lot from the presenters at the conference—I hope to post about that real soon now. In the meantime, here’s what the experience was like. The high point was volunteering. Off the North Carolina coast, the rusty coral-ridden hollows of sunken vessels have become an important habitat for a certain underwater predator, one who can’t seem to get enough of the camera. 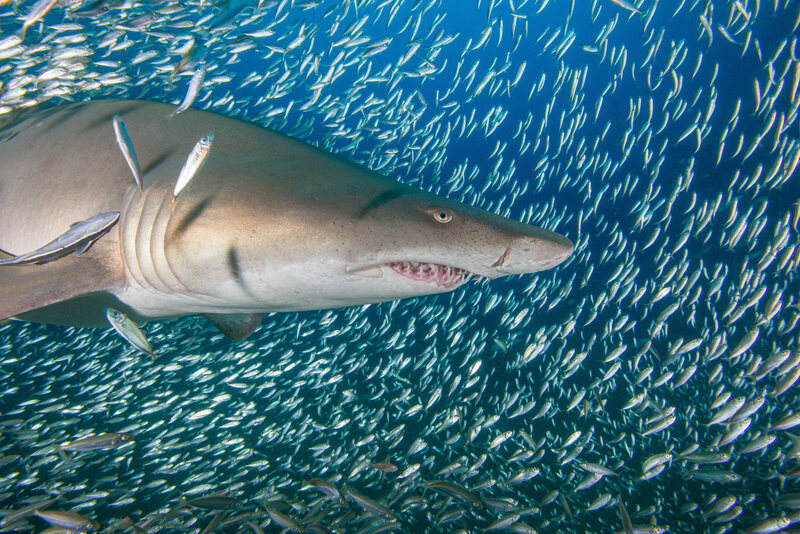 Underwater photos dating back to 2007 revealed that six female sand tiger sharks had returned to the same shipwrecks months and sometimes even more than five years apart, according to new research published in the journal Ecology. This phenomenon, when an animal returns to a habitat with some regularity, is known as site fidelity. The discovery may prove invaluable for scientists attempting to understand the conservation status of sand tiger sharks, categorized by the International Union for Conservation of Nature as a globally vulnerable species. Current sand tiger shark population numbers are unknown as the last IUCN assessment was conducted in 2005. According to a press release, it is believed that their numbers have been spiraling downward since the early 1990s. The discovery of these sunken habitats could help scientists understand where to monitor for sand tiger sharks. 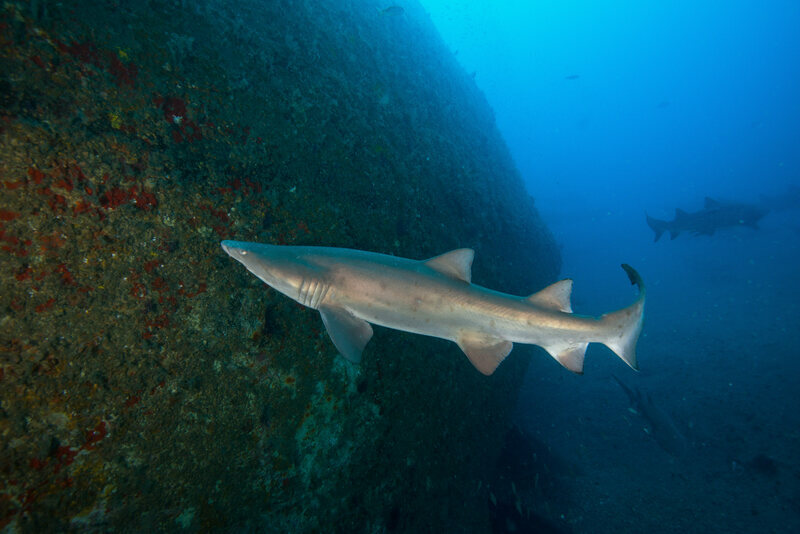 “Our finding that female sand tiger sharks return to the same or nearby shipwrecks adds to a growing body of evidence that these wrecks are very special and important habitats for a diversity of marine life, including top predators like the sand tiger shark,” says Avery B. Paxton, a marine ecologist and lead author of the study, via email. The coast of North Carolina’s Outer Banks is often referred to as the “Graveyard of the Atlantic,” due to the shipwrecks that populate the waters. This salty cemetery could now become a prime location to study the vulnerable species—and take more photos. A set of images, which were taken by scuba divers, were crucial to the team’s research. The photographs allowed researchers to identify individual sharks through their unique spot patterns and to fully understand who was returning, when, and how often. By uploading photos to citizen scientist databases, such as the Spot A Shark USA program led by the North Carolina Aquariums, divers can provide researchers with the opportunity to study an ecosystem without having to venture out the lab. Hello, Folks, Here Writes Fandom, Maybe. So the redoubtable minnehaha posted an excellent social media manifesto that makes the argument that Dreamwidth is an excellent platform for fannish communication. Here it is. It starts with the assumption that the LJ/Dreamwidth format is perfect for long-form communication - something that was as much a building block of traditional SF fandom as in-jokes, nicknames, letters of comment in zines and horrendously long fan feuds nourished over months and years by some of those LOCs. It makes the reluctant declaration that LJ itself could now be considered problematic, then says that LJ's fannish community could successfully make the leap to Dreamwidth by making the conscious decision to do so, thus reclaiming itself from whatever LJ's current operators might do. People still love LJ; their memories of its rich existence, history and shared experiences strongly tie them to it. What I like about minnehaha 's manifesto is that it doesn't denigrate Live Journal. Instead, it acknowledges it, especially the concepts that fueled the best of it - once again, long-form communication being a major part of that. In short, it's not "LJ is bad and Dreamwidth is better, so abandon the former for the latter." It's "Our community - our communities - can move here, can be reborn here, as a natural evolution of modern fandoms. 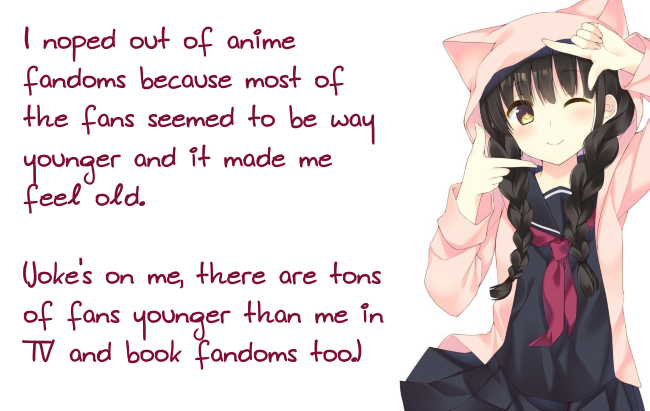 We aren't abandoning anything; we're helping our communities and fandoms survive by finding them a new home." I like that. I hope others like it too, at least enough to consider. Moving to a new house always means walking into empty rooms, and remembering the comfortable rooms one left behind. That's not unrelievedly pleasant. It's bittersweet at best. But then you fill the new and empty rooms with all the memories of the old ones, and begin the joyous journey of finding new memories as well. baked beans and hula hoops is not a successful combination. also I am out of both bread and chips. Cleo Gakshteyn had not planned to get married in a kiddie pool whose contents reached her shins. But thanks to one restaurant's penchant for pageantry, her wedding, literally dipped in chocolate, became the prelude to a 20-year union made all the sweeter for its unique backstory. In 1999, Gakshteyn (née Londoño) was running a tiny two-room spa in Manhattan with her boyfriend, David. One chilly February day, Joe Calderone came in for a facial. On the spa table, Calderone mentioned a wedding he was planning in order to promote Serendipity 3, the Upper East Side restaurant where he worked as creative chef and public relations manager. He was looking for a couple, he said, who’d get a free, Valentine’s Day wedding as long as they agreed to marry in front of New York press in a tub of the restaurant’s iconic Frrrozen Hot Chocolate. Within two weeks, Cleo and David Gakshteyn were wed. “The thing that I remember the most is the flashing lights,” Cleo Gakshteyn says, of the many photographers present. The house of Vera Wang made her a chocolate-colored wedding dress. The groom wore a top hat and a jacket previously seen on Mick Jagger. The jeweler, Harry Winston, loaned a two-million dollar, chocolate-brown solitaire diamond pendant that came with two accompanying bodyguards. There was champagne, a wedding cake, and a chocolate-inspired menu featuring chocolate pancakes and chicken breasts in mole sauce. The pornographic model Robin Byrd walked the future Mrs. Gakshteyn down the aisle. (The original choice, Fabio, the romance-novel cover model, was in an accident involving a goose and a roller coaster.) A judge officiated, and the wading pool of chocolate was mercifully not frozen. The restaurant industry is a tough business, and according a 2016 New York Times article, it's harder for an independent restaurant to thrive in New York City than, say, Los Angeles or San Francisco. In 2018, the city lost 6,000 restaurant jobs as restaurateurs cut labor costs to stay afloat. That Serendipity 3 has survived since 1954, steadily seating Frrrozen Hot Chocolate fans under its canopy of Tiffany lamps, is a witchcraft as preternatural as its larger-than-life desserts. In a cutthroat industry, where not even excellent reviews and Michelin Stars will keep you in business, Serendipity’s operating model prioritizes conspicuous consumption. Its management has collected Guinness Book records for the world’s most expensive sandwich, sundae, burger, and milkshake. They’ve also organized other stunts, such as hosting a couple who got married (to each other) 109 times, including once at the restaurant. It’s a novel way to remain in public memory, and given the establishment’s longevity, an effective one. Today, Serendipity 3 may have lost the limelight, but it continues to enjoy a following among the rich and famous, locals, and tourists alike. In its heyday, Andy Warhol was a regular, paying his tab in drawings, before he’d achieved celebrity. Jacqueline Kennedy visited, as did Marilyn Monroe. The Rockettes have swung shapely legs over the table, enjoying dessert in crystal coupes. The Kardashian-Wests sometimes walk in. Parents and grandparents bring their children for indulgent milkshakes and a moment of nostalgia. There’s still occasionally a line for a table. Servers, balancing trays full of Frrrozen Hot Chocolate, maneuver their way past selfie-takers admiring the décor. There’s a fuchsia wall bedazzled with circular convex mirrors of various sizes. A disco ball radiates light from an explosion of Tiffany lamps blooming from the ceiling. There’s no escaping your reflection, there are mirrors everywhere—vintage, beveled, golden-edged, antique wooden. The vibe is a bit like walking into a posh funhouse. This is New York as the Empire State: sybaritic showiness masquerading as quirky and fun. 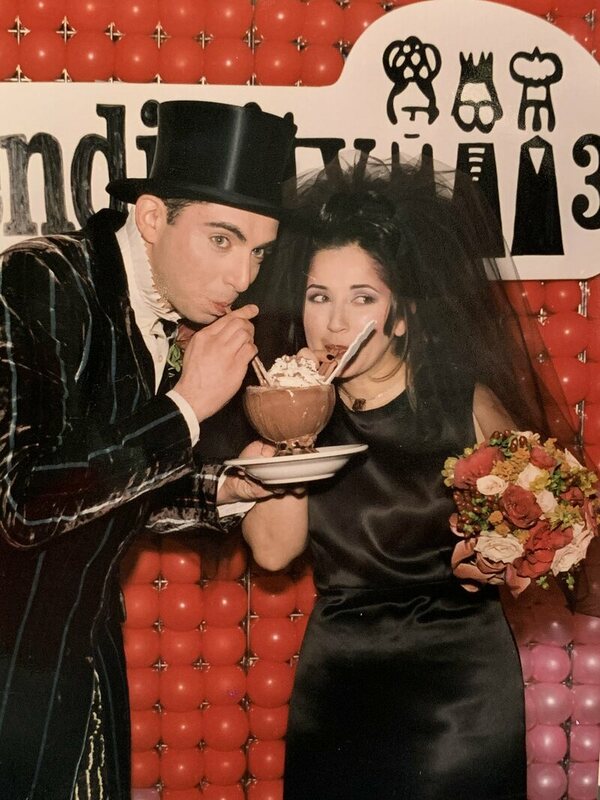 Over the years, six couples have married in a tub or pool of frozen hot chocolate at Serendipity 3. Only the Gakshteyns have done so twice. In 2014, the couple celebrated their 15th anniversary by renewing their vows in a slightly muted, but similar ceremony at Serendipity 3. 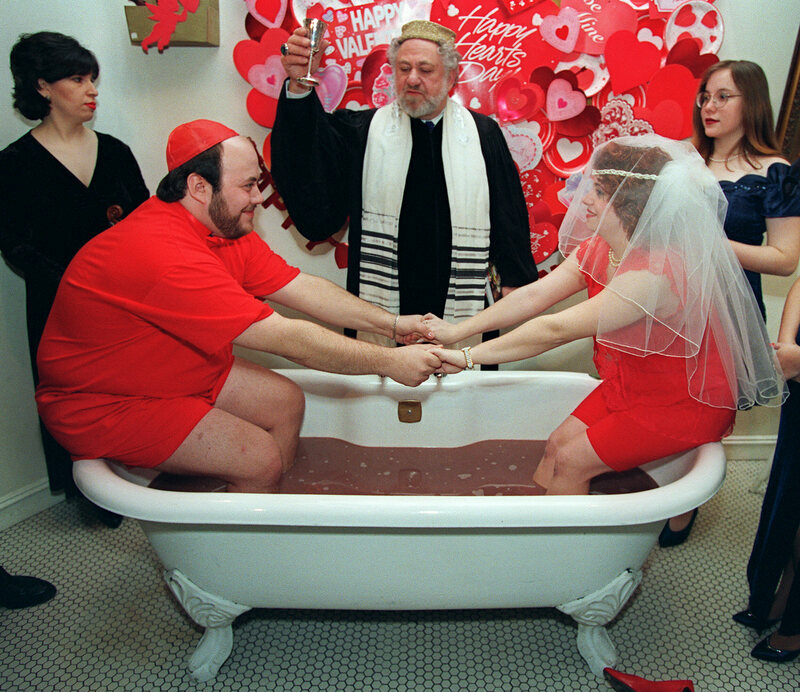 The tub of chocolate was there, but the couple chose their own attire. No pornstars this time, just some family and friends, including the couple's two sons. Serendipity, a word that means happy accident, has defined the Gakshteyns’ lives. A chance encounter with Calderone sparked the decision to get married, leading to a lifelong union. “I had no expectations, because I wasn’t expecting to get married when I did,” says Cleo Gakshteyn. Although the couple had a traditional wedding in a synagogue a month later, she has no regrets about getting married for a publicity stunt. “It was so gorgeous and beautiful," she says. MBARI researchers recently measured high concentrations of carbon dioxide in air blowing out to sea from cities and agricultural areas, including Silicon Valley. In a new paper in PLOS ONE, they calculate that this previously undocumented process could increase the amount of carbon dioxide dissolving into coastal ocean waters by about 20 percent. If only spring could be like this all the time; if it was, spring would be one of my favourite seasons. It's clear and sunny with lowish humidity, although at about 81ºF/27ºC today, it was verging on too warm for me. However, we have reached one of the times of year (the other is autumn) when I can hang all the washing on the line and be fairly certain it will be dry by the end of the day. It's very pleasant outside hanging out washing in the cool of the morning, and then bringing it in later, in the warmer afternoon, when the line is shaded by the tall trees and bamboo at the back of our property. My little viburnums have been bothering me for a couple of weeks, since the weather started to warm up. They're not so little any more, but they are still very vulnerable to being eaten by deer so they still need their protective fences. Since the fences are rather flimsy affairs of bamboo poles and light mesh, they get damaged over the winter and always need repairing or replacing spring. Also, some of the viburnums have now grown too tall for the fences I first made, so that the deer can easily reach over them. So today I finally got out into the yard and did some necessary work, replacing too-small fences with higher ones. I made them flimsy deliberately, because I don't want them to be permanent. As soon as the plants are tall enough that there are enough leaves too high for the deer to reach, I'll dispense with the fences. I'm hoping that will be next year for at least a couple of them, although there are still a couple which are growing more slowly and probably won't be tall enough to stand alone by next year. In spite of all this positive activity, I'm feeling depressed and unmotivated today. S and I were planning to go to the UK to spend Christmas with all three of my daughters and all five of my grandchildren, as my two younger daughters are planning to come from Australia to the UK for Christmas. (I believe my middle daughter will be there with River, but I'm not sure that it's definite yet. However, my youngest daughter, her husband, and Oscar are definitely planning to be there.) However, this morning S suggested that it would be better if she goes to the UK with me in August after the baby is born instead of at Christmas. She argues that it will be better weather for taking the girls on excursions such as the ones we went on while I was there this month. I agree that it will be helpful if there is someone besides me helping with Violet and Eden at that time, but I'm extremely disappointed that S wants to pass on Christmas with my family. I've spent several Christmases here with her here (sometimes with her son, sometimes with her daughter and son in law as well before William was born), and one with her and William's family in San Francisco when William was a baby, but she has never had Christmas with my family and I was eager to share our traditions with her. She was planning to go with me in 2015 when Violet was a baby, but she was prevented from leaving the country by a threatened government shutdown so I went alone. The shutdown didn't end up happening, but by the time we knew it wouldn't it would have been too much of a scramble to book her flights to the UK.